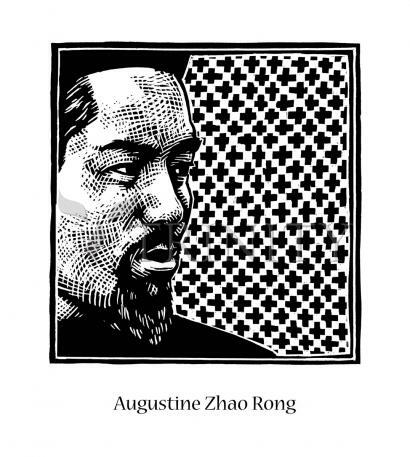 St. Augustine Zhao Rong shares a July 9 feast day with 86 other Chinese Catholic martyrs: catechists, laborers and other converts ranging in age from nine to 72, and with 33 Western missionaries. All were killed in China between 1648 and 1930, many during the Boxer Rebellion. The small crosses in this image represent them. Augustine was a Chinese soldier who accompanied Bishop John Gabriel Taurin Dufresse to his martyrdom in Beijing in 1815 (Bishop Dufresse is also one of the Martyr Saints of China). Moved by the missionary’s patience, Augustine decided to become a Catholic. Not long after his baptism he began to study for the priesthood and was ordained a diocesan priest, eventually suffering torture and death for his adopted beliefs. In big and in little ways, it takes a tremendous amount of courage to hold onto your convictions when surrounded by a culture that doesn’t share them. His feast day is July 09. Although Christianity had spread itself around the world by this time, it did not reach China until the 600’s, by way of Syria. Depending on China’s relations with the outside world, Christianity over the centuries was free to grow or was forced to operate secretly.